Cameroon is the World’s 40th ranked nation in football according to the monthly rankings released by football’s governing body (FIFA) on Wednesday. The Lions were ranked 19th in June but after three defeats to Japan (0-1), Denmark (1-2) and Holland (1-2) during the World Cup in South Africa they experienced their worst fall (21 places) since the rankings were introduced. In December 2009, they were Africa’s top ranked squad (11th in the world) and now they are the 7th best nation on the continent. They are behind Gabon (6th in Africa and 34th in the world), Algeria (5th and 33rd), Nigeria (4th and 30th), the Ivory Coast (2nd and 26th) and Egypt (1st and 9th). The current rankings simply display a disastrous 2010 in which Cameroon’s Lions have obtained 2 victories for 7 defeats and 4 draws while conceding a total of 22 goals. The FIFA rankings are made on the basis of points attributed to or deducted from senior national football teams following victories, draws or defeats within a given period. They do not necessarily tell the absolute value of a team on the pitch but they are seen as a scale of a team’s recent progress and usually used to determine seeds in tournaments. The World Champions Spain currently top the chart followed by Holland, Brazil, Germany and Argentina, in that order. Returning to a prestigious spot on the FIFA rankings may be on the mind of Cameroon’s new national team coach to be appointed before a friendly international game in August. But, rebuilding Cameroon football after World Cup 2010 is beyond quick victories or defeats. It has to do with policies and concrete action to develop the game from the grassroots and setting long-term targets to be achieved at various levels of the game and its organisation in the country. Where do we want to be in four years time? What should we achieve by 2014 or 2018? Cameroon takes on Portugal in a tasty World Cup preparatory game on Tuesday. It will be Cameroon’s biggest challenge since they started preparations for the World Cup on 20 May and the first in which the whole squad including its captain, Samuel Eto’o, would be available. Most importantly, it would be the best opportunity to verify if the Indomitable Lions’ coaching team has tackled issues such as : Samuel Eto’o’s position, who to play at right-back and the disconnect between the midfield and the attack. Paul Le Guen like his predecessors (Winfried Shaeffer, Arthur Jorge and Otto Pfister), is convinced that Samuel Eto’o is not a big, strong, leading central striker like Drogba, Torres, or Mboma. He believes Eto’o is better as part of a 3-man attack-line where he could be deployed on the left, right or centre as has been the case at Inter Milan (where Diego Milito is the centre-forward). The other option is to play Eto’o as a second striker in the hole behind a big and strong forward. Eto’o excelled in that role alongside Patrick Mboma at the start of the century. (See video of how this worked perfectly in Mboma’s goal against Ireland at the 2002 World Cup). Le Guen (like Otto Pfister before him) has used as the playmaker behind two strikers – against Egypt at the quarter-finals in Angola. Most Cameroonians, though, see Eto’o as a finisher who must be at the tip of Cameroon’s offensive play. They think any other role is a waste of potential. He ends up acting like a defender instead of being a goal threat. Where will he play at the World Cup? Should the staff choose to play him as the central striker (N°9) – who will be supporting him? If they maintain him as playmaker (N°10) – which two players will play in-front of him? Should he be asked to play the supporting role – who will be the Patrick Mboma (furthest striker forward)? We may like or hate Samuel Eto’o’s personality; think he is not a good leader; wrongly or rightly believe he has underachieved in the Lions’ shirt compared to Patrick Mboma or Roger Milla; but he remains Cameroon’s most potent threat today. It is therefore important to know how he shall be deployed at the World Cup. Cameroon has also found it hard to score in their recent encounters because the team – no link between the midfield and the attack. Observers like Roger Feutmba, a retired Cameroon international, believe that this is due the lack of flair players in the midfield. “How do you expect attackers to have the ball in a position to score when there is no one to make the pass?” Feutmba asked on a programme broadcast by the private TV channel, STV. Cameroon started against Slovakia with a midfield triangle of: Alex Song in the holding role ahead of the defence, Enoh Eyong Tarkang and Jean Makoun playing slightly ahead of him. The coordination was an improvement to what was seen in the game against Georgia but the killer pass to the forwards was still lacking. “They are all defensive midfielders – how do you expect them to be creative! ?” Feutmba said. 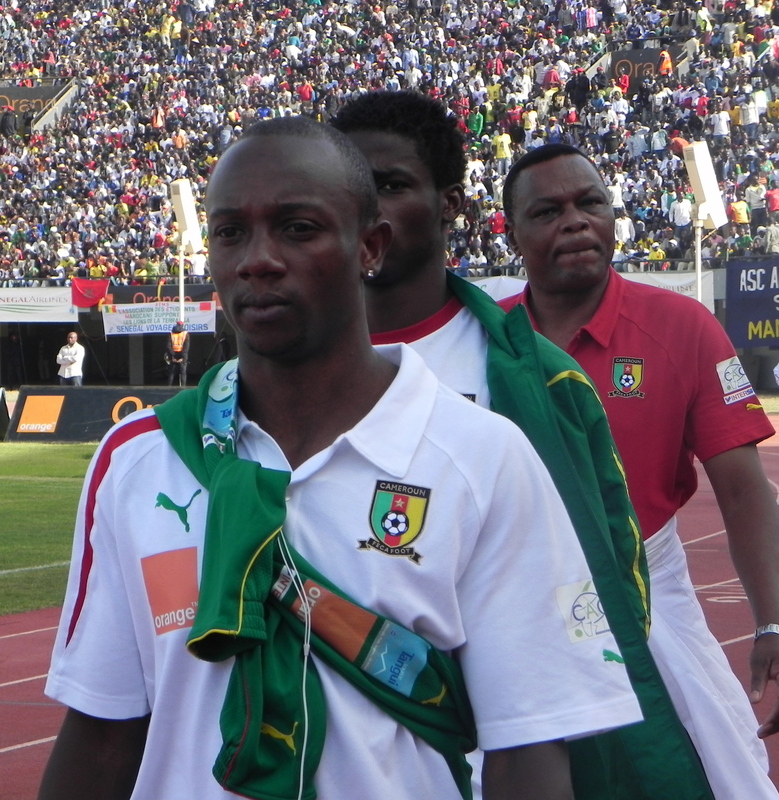 The former offensive midfielder, however, agreed that Cameroon did not possess such creative players at the moment. He thus advised that the coach re-adapt the system to the kind of players he has at his disposal – playing in a 4-3-1-2 with Emana as the playmaker behind Eto’o and another striker. Meanwhile, Cameroon is also lacking in quality wingers and offensive play on the flanks. Le Guen’s 4-3-3 formation has managed to conceal this shortcoming because attackers like Eto’o and Emana or full-backs such as Assou-Ekotto shoulder the responsibility of wing play. This worked during one-off qualifying matches but it didn’t function at the AFCON. Who is running on the right flank? The weakest link in the Indomitable Lions has, however, been the right-back position. The country has been unable to produce a top drawer full-back since Stephen Tataw retired. In 1998, Claude Le Roy and his assistant Pierre Mankowsky resolved the problem by tweaking Cameroon’s formation from 4-3-3 (under Jean Manga Ougene) to 3-5-2 before the Mondial in France. This accommodated the country’s production line of defensive midfielders – Olembe, Wome, Geremi, Lauren, Ndo – who became powerful wing-backs in a system the Lions used until 2003. Winfried Shaffer opted to play midfielders the like Geremi Njitap and Timothee Atouba as full-backs in his back four. Presently, the right-back postion remains a real head-ache. Geremi’s lack of pace and explosion has forced the coach to drop him to the reserves bench. He has tried Georges Mandjeck, Aurelien Chedjou, Abouna Ndzana, Makadji Boukar, Marcel Djeng but none has successfully imposed himself. After the friendly against Italy in March, Paul Le Guen suggested that he would field Stephane Mbia at right-back. The Marseilles player finished the season as the revelation of the year at centre-back. Will Cameroon’s coach stick to plan and use him as right-back? Cameroon versus Portugal will be an insight to Le Guen’s strategy on all of these issues. The fact that the Portuguese (who are ranked 3rd in the World by FIFA) have worries of their own offers an interesting twist to the game. Cameroon’s national football team captain and star player, Samuel Eto’o, says he has had to re-think if he must participate in the World Cup after former Indomitable Lions striker, Roger Milla ,said Eto’o had yet to prove his worth for his country and lacks discipline. Roger Milla, who scored 4 goals in Cameroon’s run to the quarter-finals of the World Cup in 1990, said in an interview on Thursday that Eto’o had given much to his clubs Barcelona and Inter Milan but had never achieved anything with Cameroon’s Indomitable Lions. ” What did he (Milla) achieve? ” Eto’o is quoted by the French news agency as saying in an interview on French TV channel Canal+Sport on Friday. “Finally you wonder whether these are really my countrymen. Are these really my people? Is it worth it to go to the World Cup?”, Eto’o added in a series of rhetorical questions. It is not the first time that Milla is harsh towards Eto’o in particular and the new generation of players in general before a crucial competition. 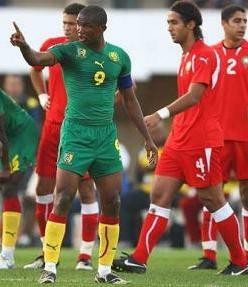 Weeks before Cameroon’s decisive qualifying game against Morocco, Milla had accused Eto’o of being a nuisance in the national squad. “He did not win the World Cup, they played quarter-finals and what a team it was! They had one the best teams with great players in each compartment. The fact that they (Milla) enjoyed glory at the age 40 does not gives them right to talk (like that),” Eto’o said. Many fans expressed fear that Milla’s comments could dent Cameroon’s preparation for the World Cup and Eto’o’s threats have proved that this might be the case in a context where the team’s stability and cohesion is uncertain. The Inter Milan player had been given 8 days of holiday by the coach, Paul Le Guen, after a long season which saw him win a second treble – national league, national cup and European Champions League trophy – with Inter Milan. The Indomitable Lions are supposed to play against Slovakia in a warm up match on Saturday (29 May) in Klagenfurt, Austria after which the coach plans to name the 23-man squad to travel to South Africa for the World Cup. Confusion from Milla’s statements which another Cameroonian football legend, Joseph Antoine Bell, described as “inelegant” only add to a series of set-backs to the team’s preparations. In fact, the team played a slack and scoreless friendly training match against Georgia on Tuesday and the coach is still unsure about the eligibility of two players, Maxim Choupo-Moting and Gaetan Bong, that he hopes to the take to the soccer tournament in June. The players had represented Germany and France respectively at youth team level and need a FIFA waiver to compete for the homeland of the fathers. 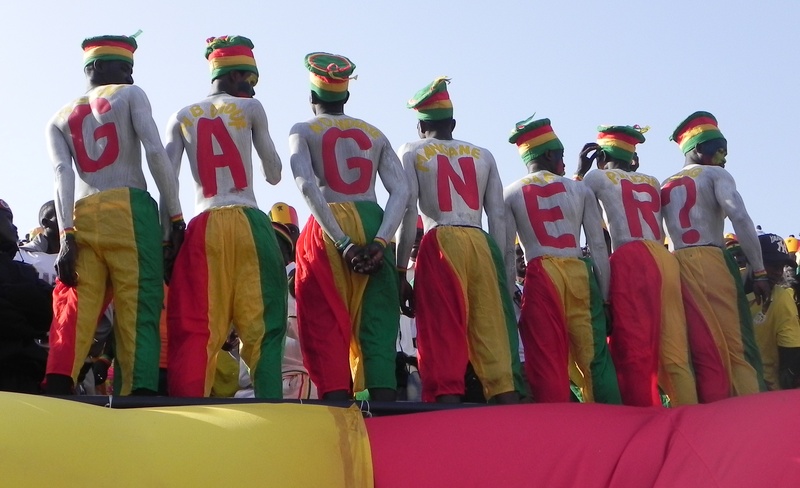 Media reports have suggested that Cameroon’s football federation (FECAFOOT) was late to start the administrative procedure to obtain the waiver. Choupo Moting’s father (who is also a football agent) clearly explains (in French) in this audio clip how the federation officials fumbled with the procedure and reveals that the football’s world body will decide on the matter next week and expects the outcome to be favourable for Cameroon. The FECAFOOT boss, Iya Mohamed, who promised that there would be a decision on the matter this Friday, would need to improve his association’s skills in negotiating complex issues. They have a test of their diplomatic skills in the form of convincing Eto’o to down his boycott threats, get back to the fold and focus on success for Cameroon on African soil. The Indomitable Lions of Cameroon are once again the best African football team according to FIFA rankings published on Friday 16 October. Cameroon moved 15 places up the ladder and now sit as the 14th best team in the world. The Elephants of Ivory Coast are now 2nd in Africa and 19th in the World while the Pharoahs of Egypt are ranked 3rd in Africa and 28th in the world. Cameroon’s run of 4 victories and 1 draw since August must have contributed to this return to the top of FIFA’s world rankings. It should be noted that these rankings are often used to pick seeded teams during competitions. But the focus for Cameroon at the moment will be winning their final group game against Morrocco and obtain a berth at the 2010 FIFA World Cup in South Africa.